YMCA Executive Director, Theresa Lubke, accepted the award from the Ohio Alliance of YMCA’s board chair, Brad Toft, at the Alliance’s annual Chief Executive Conference earlier in October. Marion Mentors 21, Marion County’s youth mentoring collaborative, was recently recognized for it’s success and is expanding after three years of providing volunteer adult mentors to Marion youth. Marion Mentors is a community collaboration, led by the Marion Family YMCA, which supports the development of one-on-one relationships between a volunteer adult role model and a student. The 2018 – 2019 school year is the fourth year of the collaboration and its fourth year of funding from the Ohio Department of Education’s (ODE) Community Connectors initiative. In its first three years of operation, Marion Mentors matched over 100 children with caring adult mentors. 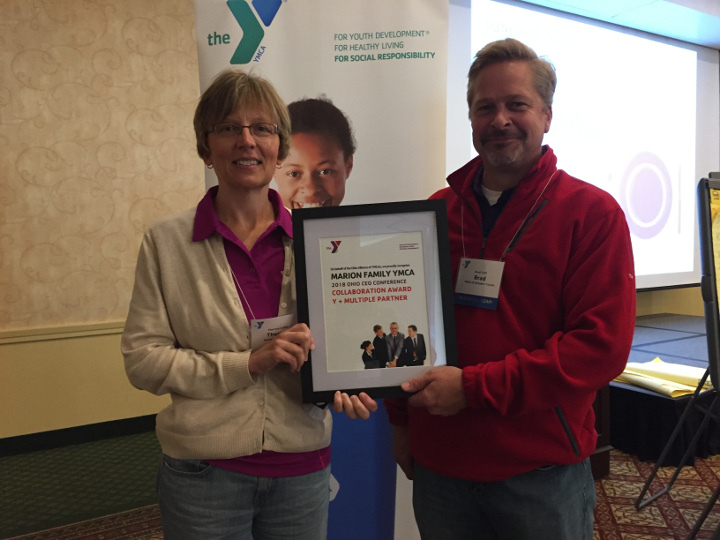 The Marion Family YMCA was recently recognized by the Ohio Alliance of YMCAs for the Marion Mentors collaboration. In recognizing this work, the Ohio Alliance of YMCAs highlighted Marion Mentors ability to measure results including that youth who regularly met with their mentors reported achieving a majority of their school-based goals and that mentored youth demonstrated an increase in important developmental assets. YMCA Executive Director, Theresa Lubke, accepted the award from the Ohio Alliance of YMCA’s board chair, Brad Toft, at the Alliance’s annual Chief Executive Conference earlier in October. Toft is the CEO of the YMCA of Greater Toledo. September marked the start of the fourth school-year of Marion Mentors. This year’s program is funded by ODE and the Marion Community Foundation. Marion Community Foundation’s match increases the impact of state funds from ODE. Lubke attributes the commitment from the Marion Community Foundation in allowing this year’s expansion. “The matching funds from the Marion Community Foundation were a key element of our funding application to the Ohio Department of Education. We were able to demonstrate impact on youth and a commitment from our community for mentoring,” stated Lubke. This year’s funding allowed the collaborative to hire its first Director of Mentoring, Erin Slater. Slater is a graduate of Harding High School and The Ohio State University with a Bachelor’s in Strategic Communication. 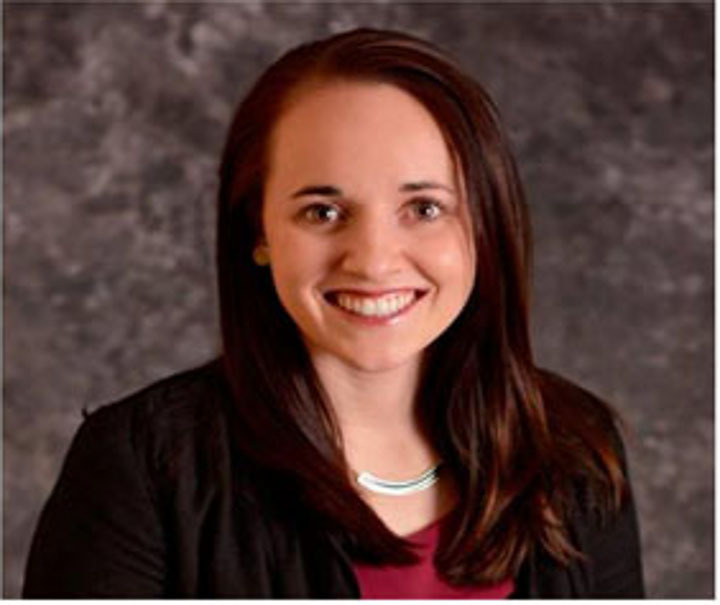 Before joining the Marion Family YMCA as Director of Mentoring, Ms. Slater worked as a SNAP Ed Program Assistant with The Ohio State University Extension. “We were excited that Marion Mentors’ success and funding from the Marion Community Foundation allowed us to invest in a Director of Mentoring. Finding Erin to be our first Director of Mentoring was ideal. She has a passion for working with young people and is known and respected within the community,” said Lubke. Slater is working with Marion Mentor partner school districts to match volunteer adult mentors with identified youth. This is the fourth year of mentoring in Marion City Schools and first year expanding into Elgin Local Schools and Ridgedale Local School District. Additional partners are the United Way, the Boys & Girls Club, the Union Bank and First Church of the Nazarene. Together, partners fill key roles including recruiting volunteer mentors, screening and training mentors, and identifying students who would benefit from a mentor. In the first two months of this school year, 79 youth are working with an adult mentor. The goal is to have at least 100 students with a mentor. In order to accomplish this, more mentors are needed. Adults may volunteer to mentor by applying online at marionmentors.org. The volunteer commitment is once per week during the school year. Mentors meet with their mentee during the school day or after school. Mentor opportunities exist at all Marion City School buildings, Elgin, Ridgedale and the Boys & Girls Club. For more information on becoming a mentor, visit marionmentors.org or call Erin Slater at 740-725-9622.